Intense fighting between rebel factions and the Congolese army spread to Virunga Park this week, threatening a critical UNESCO world heritage site and the endangered mountain gorillas. In an email conversation, Emmanuel de Merode confirmed that there was heavy shelling near Bikenga and Jomba and that park ranger Paris Paluku was killed "during a violent contact with a CNDP column that was looting a civilian vehicle near Mabenga." Two Congolese army (FARDC ) soldiers were also killed. De Merode is the chief warden of Virunga National Park for the Congolese Wildlife Authority (ICCN). 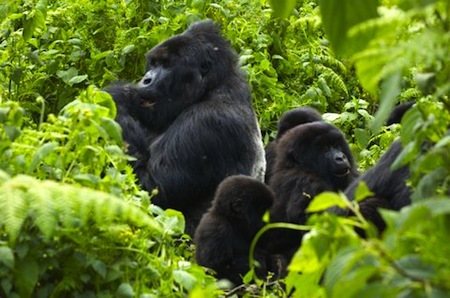 Established in 1925, Virunga National Park shelters 200 of the world's remaining 786 mountain gorillas. In a press release issued by the World Wildlife Fund, de Merode praised the slain ranger. "Paris will be remembered as one of the most courageous men to have worked in the park. He was always at the head of any patrol, which put him at risk and ultimately cost him his life." 150 rangers have died since 1990 in a region that is devastated by political instability, proxy mineral wars, and mass displacement, torture, and atrocities directed against a defenseless civilian population. 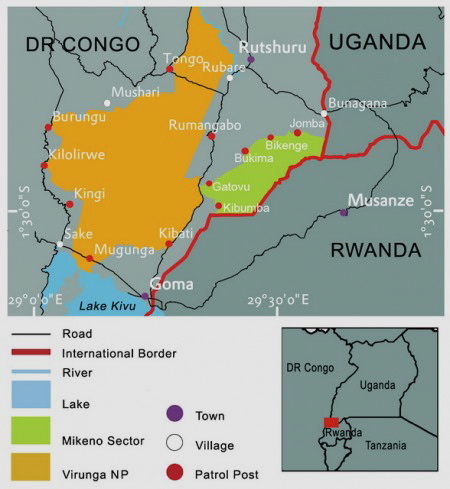 The United Nations High Command on Refugees (UNHCR) reports that, as of last week, more than 8,200 refugees had fled from DRC's North Kivu Province and into Rwanda, where an additional 55,000 Congolese refugees are warehoused in IDP camps. Fighting between the Congolese army and former commander Bosco "Terminator" Ntaganda has intensified and resulted in the closure of five patrol posts in DRC's Virunga National Park. Ntaganda is wanted on arrest warrants by the International Criminal Court (ICC) for war crimes. Writing on his blog, de Merode describes the intense shelling by government forces. It has, once again, been a long week, with the sounds of war in the distance. We are still trying to understand the conflict on our doorstep, and much of our information suggests that it will get worse before it gets better. There was heavy shelling again this morning towards Bikenge on the edge of the forest. This is where the Rugendo and Lulengo gorilla families tend to live, so we are very worried about them. Since the arrest and detention of former CNDP General Laurent Nkunda by Rwanda during a phony peace summit in January 2009, the CNDP has been split into two factions. The "Terminator" Ntaganda was installed by Rwanda and Congo as the defacto CNDP leader in a bloodless coup and integrated into the regular Congolese army. However, many CNDP regulars remained loyal to Nkunda, effectively creating two CNDP factions. When international pressure to arrest Bosco Ntaganda for war crimes reached a tipping point in April 2012, Congolese President Joseph Kabila ordered his arrest. Kabila had once considered the warlord his lynchpin in the 2009 Amani Leo peace deal. Amani Leo amounted to signed separate peace agreements with the CNDP and other armed groups in North and South Kivu Provinces. The hope was that armed groups would be granted political party status. The Congolese parliament passed an amnesty law that pardoned people for crimes committed in the eastern DRC during the fighting, with the exception of war crimes. In early April, Kabila suspended Amani Leo, ironically meaning "peace today" in Swahili. Reuters reported Congolese Colonel Sylvain Ekenge said, "Amani Leo will come to an end but will take another form, which has yet to be established." The operation involved 26 regiments in North and South Kivu Provinces. Radio Okapi reports that there has been a second split, with Nkunda loyalists who were once forced under Ntaganda's command creating a new movement known as March 23 (M23). 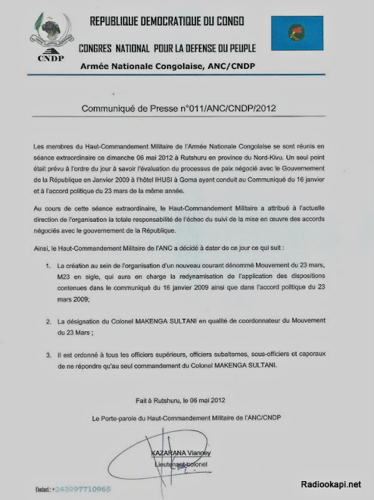 The creation of M23 was announced in a press release signed by spokesman Lieutenant Colonel Kazarama Vianney. "The purpose of this movement, according to its creators, is to reinvigorate the peace agreement signed in 2009 between the Congolese government and CNDP," Radio Okapi reports. M23 is the result of a meeting that took place between officers of the former rebel Nkunda's National Congress for People's Defense (CNDP) in Rutshuru territory. Rebel leaders are calling for a return and "reinvigoration" of the peace process signed with the Congolese government on March 23, 2009. Peace is elusive, considering the mind-boggling numbers of rebel and government forces at play. The M23 press release says that the M23 is coordinated by Colonel Sultani Makenga, former deputy commander of Amani Leo operations in South Kivu. Makenga broke from the ranks of the Armed Forces of the Democratic Republic of Congo (FARDC). There have been unconfirmed rumors that Makenga has captured the Terminator Ntaganda and is using him as a bargaining tool. We first discussed Makenga in late 2009. According to Section 184 of the 2009 Report of the Panel of Experts, Makenga was already on the United Nations' radar as a fierce Nkunda loyalist. The panel of experts provide a prescient analysis of Makenga's role. According to interviews with several members of CNDP in the Democratic Republic of the Congo and Rwanda, the decision to remove General Nkunda caused a division within the CNDP officer class, many of whom felt betrayed by General Ntaganda and remained fiercely loyal to General Nkunda, notably Colonel Sultani Makenga, formerly the third most senior officer in CNDP. In particular, these divisions culminated in a near shoot-out between rival factions of CNDP at the Grands Lacs Hotel in Goma on 5 June 2009, following an argument over the control of the smuggling of timber sourced from Rutshuru and Masisi territories through the Bunagana border post. Active CNDP elements have informed the Group that these internal divisions are still significant, although there have also been moves by top CNDP political and military figures to bridge these divides. What we do know now, according to sources, is that Makenga and his forces are entrenched on hillsides in Virunga, about 60 kilometres (35 miles) northeast of Goma. Makenga knows this territory well and so far has withstood attacks from tanks, artillery and helicopters. The former CNDP leader knows how to hide. When we visited Jomba in 2009, while it was still in the hands of the CNDP, the stronghold was under attack from Chinese-made helicopter gunships that failed to make a dent in the ranks of the CNDP. 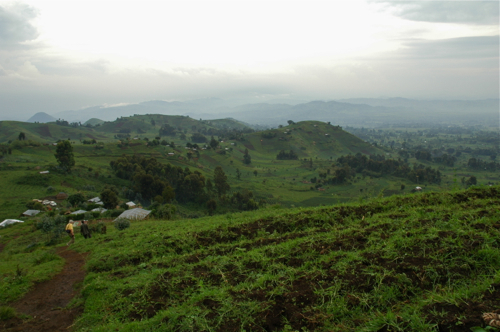 This is also prime territory for the endangered mountain gorilla. As tragic as the human loss has been over the last twelve years of civil war, perhaps the threatened loss of more mountain gorillas will focus world-wide outrage on what is happening in eastern Congo and put a stop to it once and for all. Humanity is at the breaking point.